As so many others, I’m busy preparing for Christmas. It’s nice to have a time of year where we particularly focus on being kind to our family and friends, but it can also be stressful: How we going to fit all those relatives in our house? What presents do we need to get? When’s the last posting date? However, this also made me think about some of the simple ways we can get our homes ready to welcome family and friends, while also being kind to the planet and to our children’s future. These all relate to avoiding draughts and reducing the “air leakage” in our homes from all the little crevices and cracks, particularly in an older home. They easily lose half of a home’s heat. Draughts also effectively make your home smaller than it needs to be, because no-one wants to sit in that cold draughty corner. Even subtle air movements will make it substantially colder, particularly downstairs. This is the last thing we want, particularly when welcoming a house full of people at Christmas. An easy way to find draughts is to go round on a windy day and feel for them with a wet finger (this will feel colder if in a draught). An alternative is to hold up a little fluttery piece of foil (an old crisp packet is ideal) which will flap in a draught. This could be a good detective project for the kids to do? Doors, windows and letter boxes are a common source of draughts and air leakage. Gaps in sash windows can very easily be temporarily draught proofed using “magic” easy-to-remove invisible scotch tape. Wonky doors can be draught proofed with screw on metal and rubber sealing strip. These cost about £25 from DIY Stores and include a range of rubber or brush seals. An eco letterbox flaps helps reduce draughts too. Open chimneys are a huge source of heat loss. If Father Christmas can come down, similarly all the nice warm air created by your central heating will rise up the chimney and be lost. This is why traditionally many fireplaces had a shutter that could be used to block off the chimney. Today, some people use a carrier bag filled with scrumpled paper to block off most of the air flow. But clearly, if you do this, it’s absolutely essential that you remember to remove it before using the fireplace. The best solution of course, is to have unused chimneys properly blocked up and where you do want to have a real fire, to install a modern high efficiency woodstove instead. This will reduce the heat loss up the chimney, will burn less fuel and will create much less air pollution than an open fire. Despite how things seem on the surface, I’m not anti-Christmas. Sure, I actively avoid the Christmas isle at the supermarket and avert my eyes from the ads, but it’s not because I harbour any ill will towards the holiday. There are all sorts of Christmas traditions I enjoy. I love making my great-grandmother’s Christmas pudding recipe. I look forward to off tune family Christmas carols and a good Christmas day board game. I like decorating the house too. No, what sends me into despair is how the quiet charm of Christmas has turned into a process of making lists of who we need to buy gifts for, gathering lists of what people actually want, fighting the crowds to find gifts and buying wrapping paper which will just get thrown away. It’s social pressure. Gift giving is just the done thing. Only it creates an environmental pressure too. We already have a lot of ‘stuff’ in our lives without Christmas gifts. In fact our stuff accounts for a whopping 40% of the average UK carbon footprint, more than travel or heating the home. When given the opportunity to open up at our events we find many people have similar worries. It can be tough trying to enjoy the festivities without it costing the earth. So this Christmas to help out we’ve created a 5 step guide to greener gifting. Our present to you. Make sure the gifts you give are durable and repairable. Check out buymeonce.com for some good suggestions. Talk to your family about gift giving. Maybe they’d like to cut down too. Perhaps you could start a secret santa so you’re each only buying one gift. Experiences often have a lower environmental impact. Give photography lessons for the artistically inclined, or take the DIY approach and create some vouchers for breakfast in bed. Why own the drill when all you want is the hole? Memberships make good gifts. Consider a MakeSpace membership for family members into DIY, or a music streaming service for music lovers. Furoshiki (traditional Japanese wrapping cloths) are beautiful, practical and can be used time and again. Try making your own using some second hand fabric. A version of this blog post first appeared on the Cambridge Independent on the 15th November 2017. Chris Moller is a retired electronics engineer, a Visiting Researcher at the Open University and organiser of the Cottenham Repair Café. His other activities include International Electrical Standards and managing a Vocational College in Ghana. My dad would never own anything unless he understood how to repair it, and he would hardly ever throw anything away unless it had been repaired at least a couple of times. He said he never wanted to get into a situation in which he was dependent on someone else to be able to carry on doing what he was doing. In today’s hi-tech world, this is no longer possible. As technology has advanced, repairability has gone backwards. You cannot understand how something works just by taking it apart. As likely as not, all the clever stuff will be in the program of a silicon chip somewhere inside, that no-one but the programmer who works for the manufacturer actually understands. Service manuals are no longer published. In any event, the manufacturing will have been done by a surface-mount placement machine (a robotic machine costing hundreds of thousands of pounds), making manual replacement of parts almost totally impossible. One of the lessons you quickly learn when you run Repair Cafés is that the older something is, the more likely it is to be repairable. Old radios and TVs have the circuit diagram inside the back panel or in the user manual. They do not need specialised tools to repair. The implications of this for society are serious. Hi-tech products manufactured in the last few years are designed not to last – the manufacturers have a financial incentive to ensure that they don’t. That’s the way the capitalist system works. They don’t want you to repair the old one – they want you to buy a new one! You can of course read various things into these graphs. Generally items that are nearly new have simple things that need sorting – perhaps because the user didn’t understand how to use the product. However, the dip at 3-4 years is worrying (it has been stable throughout the two years we’ve been monitoring it), and it suggests that hi-tech products are no longer being designed to last longer than this. We should be pushing back and complaining to manufacturers about this. My parents had many cherished heirlooms that were still useful and able to do their job after many, many years. I wonder how many of today’s hi-tech products will still be serving their purpose for our grandchildren when they’re our age? Chris Moller is a retired electronics engineer, a Visiting Researcher at the Open University and organizer of the Cottenham Repair Café. His other activities include International Electrical Standards and managing a Vocational College in Ghana. A version of this blog post first appeared in the Cambridge Independent on the 18th April 2018. Britain has an ongoing housing crisis that is preventing its population enjoying full and healthy lives. Collectively, because of the way our homes were built in the past, and to a lesser extent the way they are still being built, we are locked into a culture that requires us to pay far more than we need in energy bills whilst forcing many of us to live in unhealthy and uncomfortable homes. What to do about this crisis has been troubling governments, councils, charities and individuals for some time. The main issues with the remedy, as you might expect, is money and political will. Retrofitting old houses and building higher quality new homes is more expensive in the short term but gives substantial benefits over many years. Up until the last three years government offered various programmes to help the nation get to where it wanted to be. But since David Cameron famously announced he wanted to ‘cut all the green crap’ most of these programmes have gone – the Code for Sustainable Homes, Zero Carbon Homes legislation, the Green Deal, grants for home insulation. It’s easy to pigeon hole these programmes as just being about the environment but in fact they were also about wellbeing. Low energy homes are generally also healthy homes. With no new extra money and encouragement from the top it has been left to individuals, councils, business and charities to keep going regardless. Thankfully many of their efforts have been successful. Take for example Cambridge Open Eco Homes, which helps individuals to visit greener homes around the Cambridge area. Open Eco Homes gives visitors exactly the sort of information, encouragement and inspiration they need to create the healthy low energy home they want. Find out more at www.openecohomes.org. A version of this blog post first appeared in the Cambridge Independent on the 23rd September 2017. Repair Cafes. ‘What a jolly good idea’ is what I think Sir David Attenborough said to me as I introduced him to the concept in April. My recollection is blurred by endorphins and adrenalin - this was a huge, bucket list moment for me. I explained that Repair Cafe’s are free community events, matching experienced repairers with people needing stuff fixed. They are a significant part of the reason I recently disclosed to a friend that ‘I would probably go into work and do my job, even if I wasn’t paid’. I work on lots of environmental initiatives and only recently realised why Repair Cafes are so special. It’s the kindness. Highly skilled, professional engineers and repairers share themselves and their tools to unreservedly help a stranger. The repairers talk through what they are doing and a brief relationship is struck up. Repair Cafés are the proper Big Society, helping in a small way to tackle poverty and isolation. Repairer Chris Moller says he does it ‘Because the delight on peoples’ faces when you bring something back from the dead that they had totally given up on, is priceless’. It seems generosity is infectious. Repair Cafes are springing up all over Cambridgeshire and the entire world –1,370 are registered and stretch from Chile to Japan and Norway. Kate Boursnell from Transition Cambridge is involved because ‘… they help people’s stuff last longer, so we use fewer resources and less energy to make new things.’ In terms of climate change, this is crucial. Our consumption makes up 30-40% of global greenhouse gas emissions. Per capita Britain is one of the top five nations creating electronic waste. The average Briton dumps 23.5kg of e-waste each year. A version of this blog post first appeared in the Cambridge Independent on the 18th October 2017. Cambridge has the highest density in the UK of really good quality ‘Code 5 for Sustainable Homes’, like those in Eddington and Virido in Great Kneighton. But disastrously the government scrapped this whole building Code, along with ‘Zero Carbon Homes’. I fear much new building will be to minimum standards. And even the claimed standards aren’t met in many homes, as revealed by people trained and lent thermal imaging cameras by Cambridge Carbon Footprint through the winter. With climate change we have to expect more extreme weather and this year we’ve already had a very wet spring followed by the heatwave and drought. Cool yourself with a water spray, damp towel or cold pack. Have regular cold drinks. Shade your home on the sunny side with external blinds or awnings - drawing curtains or blinds helps too. Shut windows, vents and doors to keep out hot air, opening them to cool your home at night. Avoid unwanted heating from appliances, lighting or hot pipes. Insulation that helps keep your home warm in winter will also help it stay cool in summer. Older people and young children are most at risk from over-heating, especially if their home is hot. If you know people like this, and your home is fairly cool, can you be neighbourly and invite them to cool off or maybe offer practical help? Last year, one of our volunteers, who was trained and lent a thermal imaging camera, helped a friend with a lovely new sunny flat in Trumpington Meadows understand why her flat was unbearably hot. The over-heating was mainly caused by having large windows on the sunny side, without any external shading, and by not having any through-ventilation. Imaging revealed that it was made worse by many poorly insulated hot pipes that ran through the flat. Our volunteer advised using blinds to keep the sun out and provided the thermal images to help get the developer to insulate the pipes properly. Sadly this remains an all too common example of a new home built without the design details keep it comfortable in heatwaves. The UK independent Committee on Climate Change says new homes must be designed and built to be prepared for a changing climate, and that this needs to be put into building regulations, along with effective enforcement of the standards. There’s ever-growing evidence that wood-burning is a big contributor to air pollution, especially in cities. You can reveal where buildings are wasting heat with vivid thermal images… this guide shows how with lots of practical examples. I’ve been testing the £200 Flir One smartphone add-on. It’s as good as CCF’s £1,800 thermal imaging cameras with smartphone advantages, although not so rugged. Many more community groups and individuals can now afford to use thermal imaging to show poor insulation, draughts and other ways our homes loose heat. Drawing on CCF’s experience of thermal imaging since 2009, this guide aims to help many others get started and to supplement our training sessions. Today’s blog is another cross post from the Open Eco Homes blog. If this post gets you enthused about hempcrete make sure you check out the hempcrete workshop being offered at Thoday Street. At the time of writing there are two half price tickets up for grabs! This years Open Eco Homes features Thoday Street, a house where the emphasis is firmly on natural building materials. 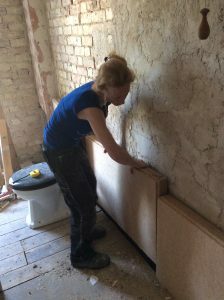 Alex Jelly (pictured here with her Cob pizza oven and installing wood fibre insulation) and partner Mike are determined to make their eco-renovation affordable and natural, and want to help others do the same. As Alex points out in her case study “indoor air pollution is generally far higher than outdoors (a fact that shocked me when I first found out)”. Does your Combie fire up at odd times? Today’s blog is a cross post from the Open Eco Homes blog. 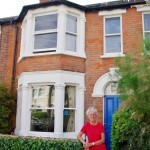 Written by Anne Miller, a former Eco Homes host this blog post is a great example of the sort of detailed advice you get on an Open Eco Homes tour. Bookings are now open for tours on September 18th and 24th. About a month ago, after we’d had a few plumbing jobs done, we noticed that our Combie boiler was turning itself on every time we used a cold tap. Or more precisely, the boiler turned itself on briefly, a few seconds after we turned a cold tap off. Please ask your MP to support the Environment Pledge. The Brexit negotiations pose many threats and opportunities for UK environmental protection and our urgent transition into a low-carbon nation. If red-tape slashing vested interests get the upper hand, vital protections for our wild life, countryside and seas will be swept aside. Also support for changing our industries, energy supplies, homes and lifestyles into the low-carbon future we need to avoid dangerous climate change. Open Eco Homes Project Worker?